"They wanted Darryl and me to form another group which they wanted to call Deep Frieze. The gimmick was that they wanted every guy in the band to be named after a type of material, meaning cloth material. So obviously Darryl Cotton was fine but they wanted me to call me Terry Lean and I was to have a brother called "Crimp" (as in terylene and crimplene)." So we're sitting there thinking, hang on, we've already been through "Think Pink - Think ZOOT" and these guys are wanting us to do a similar, if not worse, thing. We promptly told them that to pursue this kind of idea, they would get laughed out of the country. Instead we talked them into doing a duo using just Darryl and myself and calling ourselves Frieze." With financial backing from Frieze, they bought a station wagon, a sound system and a tape recorder, which they used to provide pre-recorded backing for their shows and, of course, they were kitted out with a wardrobe of Frieze suits. They performed mostly in shopping malls, performing songs while male models showed off the latest Frieze suits. They played popular hits of the day including songs by Crosby, Stills & Nash and Neil Young and they also did an Everly Brothers medley. During the latter stages of the group, they drafted in ex Brisbane 4-piece Burke & Wills as their backing group. Frieze lasted almost exactly one year, from June 1971 to June 1972. Their first single, a cover of Barry Mann and Cynthia Weil's "Feelings" (Sep. 1971), came out on on Robie Porter's Sparmac label and managed to scrape into the lower reaches of the Melbourne chart. They were then signed up by the newly established Australian division of Warner Brothers Records. Frieze recorded two singles for Warner which were released during 1972, but neither appears to haev made any impression on the charts. Frieze's first single for Warner had Daryl's "Try Yourself" on the A-side, backed by one of Beeb's first recordings as a songwriter, "You and I". The third and last Frieze single featued two siongs by Daryl -- the mawkishly-titled "Why Do Little Kids Have To Die", backed by "Jimmie and Jessie". 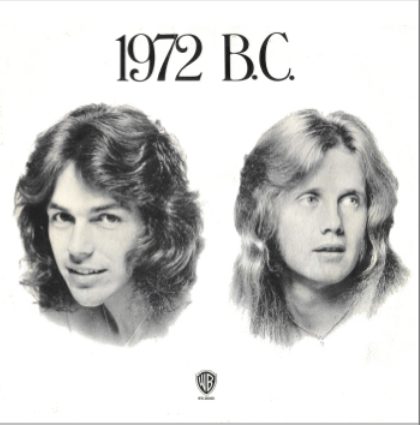 The duo also recorded a full album, titled 1972 B.C. It was produced by Brian Cadd; contrary to the information in Ian McFarlane's Encyclopedia, the LP did not feature Burke & Wills; the album lineup included several of the same musicians who had recently worked with Cadd on Russell Morris' acclaimed Bloodstone LP -- Cadd on keyboards, with guitarist Phil Manning (Chain) and bassist Barry "Big Goose" Sullivan (Chain), drummer Ray Arnott (Spectrum, Mighty Kong), session guitarist Charlie Gould and renowned jazz and session flautist/saxophonist Graham Lyell. By mid-1972 Birtles had grown tired of the gimmicky act and he told Cotton and manager Jeff Joseph that he was quitting, so the duo split; in July Cotton left for the USA, where he spent several years, becoming part of the co-called "Gum Leaf Mafia". Meanwhile, Jean Gair offered Birtles a job answering phones at the AMBO office for $50 a week. It was there that he took the call that changed his life -- he answered the phone one day and a voice said, "Yes, I was wondering if you could help me, I'm trying to get in touch with Beeb Birtles?" The voice belonged to musician Graeham Goble, formerly of Adelaide folk-rock group Allison Gros, who wanted Beeb to join his new band Mississippi. Beeb accepted, although Goble wanted him to play guitar rather than bass. The other members of Mississippi reportedly opposed this at first but Goble threatened that he would quit if Birtles wasn't hired. The rest is history -- Birtles and Goble formed a successful musical partnership that endured through Mississippi and eventually led to worldwide success with Little River Band. Daryl Cotton returned to Australia in the late 1970s and moved into TV, becoming a popular children's show host. He later returned to music and over the decade he has been part of a trio with his old mate Russell Morris. The original third member was Ronnie Burns, but after Ronnie retired from performing he was replaced by former Masters Apprentices lead singer Jim Keays. Cotton, Keays & Morris played together regularly until Jim was sidelined by ill-health. "Why Do Little Kids Have To Die"